Cpl. 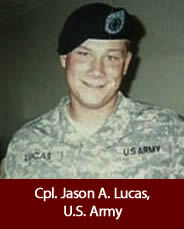 Jason A. Lucas, U.S. Army, age 24, of Columbus, Ohio; assigned to 2nd Battalion, 30th Infantry Regiment, 4th Brigade Combat Team, 10th Mountain Division (Light Infantry), Fort Polk, La. ; died Oct. 13, 2006, from injuries sustained when his vehicle was struck by a suicide bomber using a vehicle-born improvised explosive device in Kandahar, Afghanistan.